A crucial item on any vehicle engine is the timing belt, this is a serviceable part that has a required changing schedule supplied by the vehicle manufacturer. Depending on age and mileage cam belts and there pulleys, also known as a “cam belt kit”, Timing belt repair is required at these scheduled intervals. Changing a cambelt kit is an extremely delicate job and if performed incorrectly can have devastating consequences to the engine. At PDL we are a Dayco supplier for timing belt repair, so we offer a full parts and labour warranty with any Dayco kit supplied and fitted by us, giving you the peace of mind that your covered for all eventualities. 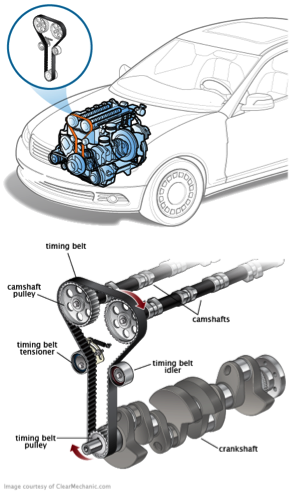 Timing belt is a toothed belt that connects the engine crankshaft to the camshaft or camshafts. The timing belt is needed to synchronize the camshaft to the crankshaft position, so the valves will open and close at the proper time in the relation to the position of the pistons. Why is it important to replace it? The timing belt serves a very important part when it comes to making your engine run. Namely, the timing belt is the belt that controls the camshafts in your engine and keeps the entire operation running smoothly. Due to the belt being made of rubber, it ages and with constant use is under stress. Typical causes of timing belt failure vary from old age to contamination by an adjacent oil or water leak. Bad fitting, such as either under- or over-tightening a new belt, can cause it to fail prematurely, as can failure of neighbouring components. Timing belts do not tend to snap – it is more common for the belt’s teeth to experience stress cracks at their roots, prior to becoming detached. In some cases, idlers and tensioners can seize, throwing the timing belt from its pulleys and causing extensive damage to the engine, with bent valves and even holed pistons resulting. All of which will lead to expensive repair bills. 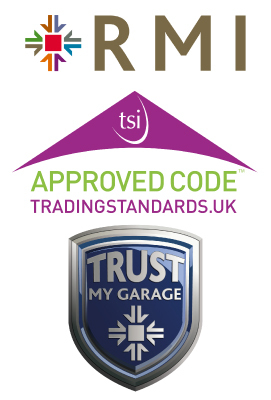 Many engines also utilise the timing belt to drive the water pump, which can also seize with the same consequences as failed tensioners, so you should not think that your garage is profiteering by suggesting that the water pump needs to be replaced as well. We also check the strength of antifreeze and condition of fan belts (alternator / power steering belt etc ) as in many instances these will need to be removed to get to the timing belt repair done.